Symposium’s EM Mobile data solution has been taking the US by storm, and all the while departments north of the border have been watching and planning how to move forward with their own implementations. Now Barrie Fire and Emergency Services has become the first of Symposium’s Canadian clients to go live with the EM Mobile, providing the department with what may very well be the most advanced mobile data capability of any emergency service provider in the country. Now when they respond to a call, Barrie personnel man trucks featuring rugged touch screen displays that provide the address, the type of event and the map-based physical location, along with all information stored in both the Symposium CAD and FIREHOUSE® RMS such as dispatcher’s incident notes, premise info, materials stored on site, contact persons, and a host of other critical intelligence. The system is fully interactive, and personnel mark their own status changes and benchmarks directly from the vehicle, as well as enter event notes at the scene. Because all information is in real time and all the systems are fully integrated, anything entered in the CAD, RMS or mobile data is instantly populated to the other systems as appropriate. 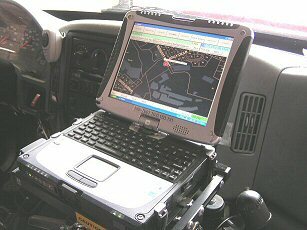 Using integrated GPS/AVL, the EM Mobile shows Barrie dispatchers and responding units the location, speed and direction of all vehicles in play. The system incorporates subtle yet highly useful tools such as a night vision mode and a map that changes orientation based on the direction the vehicle is moving. Going forward, the EM Mobile’s integration with the Pictometry® imaging system gives Barrie Fire the option to incorporate oblique visual photos of all premises within the city, giving personnel a more realistic view of the premise they’re responding to.